Leslie Jordan is the type of person who, were he seated next to you on an airplane, you’d actually want him to talk to you, and you’d maybe dread that the flight would end. Perched on his knees and leaning over the back of a sofa like you’ve just met at a slumber party he’s throwing, Jordan holds court with reporters like a pro—answer, joke, story, “you’re wellllcome;” answer, joke, story, “you’re welllllcome.” Yet it never stops feeling like he’s enjoying this conversation he’s having with a big group of people, one at a time. There’s no doubt that it takes a lot of skill to be one of the funniest people on television, but having that kind of spark doesn’t hurt. It’s a combination that won him an Emmy (for Will & Grace, in 2006). And it’s a combination on regular display in The Cool Kids, his new Fox sitcom with David Alan Grier, Martin Mull, and Vicki Lawrence. It would be easy to compare The Cool Kids to The Golden Girls, so hell, let’s do it. If the cool kids of The Cool Kids—co-created by Charlie Day of It’s Always Sunny In Philadelphia—were assigned roles in The Golden Girls, Jordan’s Sid would be some kind of Blanche-Rose hybrid, and that is high praise. He’s got unassailable timing. He’s got undeniable charm. And he is the kind of person with a treasure trove of stories to tell. We asked him if a hot dog is a sandwich. 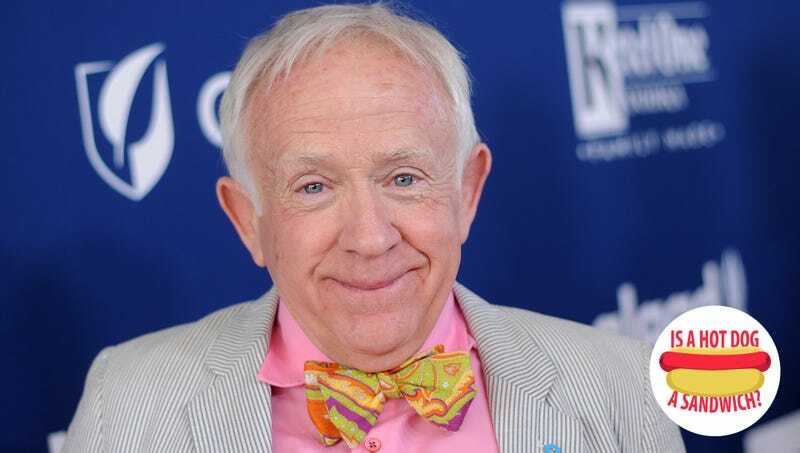 Leslie Jordan: I don’t know! Why are you asking me that?! What is that from?! TO: I write for a food and drink site called The Takeout, we’re asking lots of people that. LJ: Someone else asked me that! Who would have asked me that?! Is a hot dog a sandwich? I don’t know. I read that book, I don’t eat hot dogs. You know that book? That book you had to read in high school about the food industry in the ’20s? What was it called? Oh, I can’t think of it, I can’t think of it, what was it called? LJ: I think so! I think that was it! Ugh. Anyway, I can’t eat hot dogs. TO: So it doesn’t matter if it’s a sandwich, it’s just a non-entity? LJ: [still laughing] Of the cow! And that’s all! And when you chew it, that’s what you taste! TO: Wow, okay, thank you so much!